This week has been going exceptionally well. I continue to gather signatures for ballot access in the election, and even though I do technically have the required amount, I want to ensure that it is over the threshold in case someone forgot to register to vote, or they can’t be found due to marriage etc. Fundraising has been a little slower than I had originally anticipated, but I am sure that it will pick up as time goes on. After all, we are a year away from the heavy campaigning. I am very grateful for those of you who have been so kind as to donate to the campaign. We are ramping up to bring a new website design. Originally, we were going for something very simple to get out immediately, but now that we have the time to work on it, my team will be putting out something I think you will all enjoy. 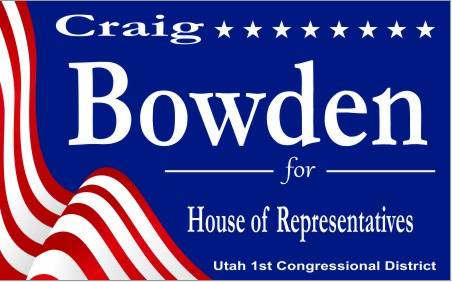 The basic design will encompass exactly what I believe in as a candidate, and will help demonstrate exactly what I will do as Utah’s representative in the House. I want to especially thank the volunteers who have been helping get the word out about me. I honestly do not know what I would do without the wonderful people working with me. They have been helping get signatures, providing materials to the voters, and doing a lot of leg work. We still have a while to go, but the group of individuals I am working with are dedicated volunteers and I really cannot thank them enough. I also got word back from the Federal Election Commission finally so that we can begin our required quarterly filing of financial statements, and I have also received what I needed from the House Committee on Ethics. As things continue to come together and ducks line up, I get more hopeful as this turns into a reality. Please be sure to stop by the website at http://craig4congress.biz.ly and make a donation. We cannot make it without your help. And if you are in the North Ogden area, feel free to stop me if you see me and ask me any questions you may have. I would also recommend stopping by the events page on the website so you can find out where I will be and meet me. I appreciate all the hard work and perseverance so far, and know the Craig Bowden team will make it far in this election cycle. We will be right here!